Position Sensing Tie Rod Hydraulic cylinder with a positioning rod. It connects to the electronic controls to tell you how far it's extended control in depth and or height. The PDB is a DB Series cylinder with an added internal or external position sensing device for steering, depth control and other applications. 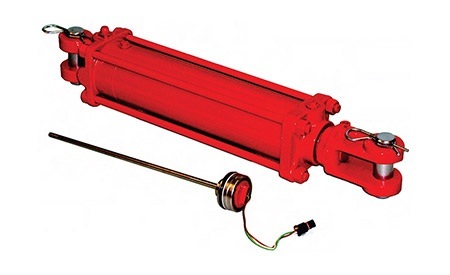 All Sensor components (except for electrical connector) may be embedded internally within the Cross hydraulic tie rod cylinder for superior durability and long field life. The PDB series is rated to 2500 psi—2” through 5” bore sizes.